In just a few hours, the Big Ten football season will begin. 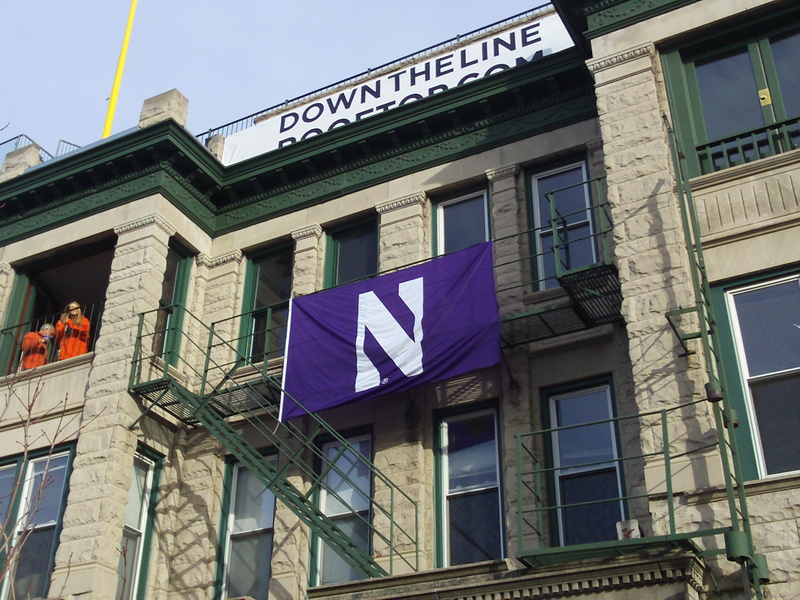 As a Northwestern alum, football hasn’t always been something I looked forward to. In fact, the team in 2012 already has as many wins (four) as they did in my last three years there combined. If there’s anything more painful in sports than watching your school go 0-11 for a season, as they did when I was a senior in 1989, I haven’t experienced it yet. No, wait, I’m a Cubs fan. Yes, I have experienced something more painful. 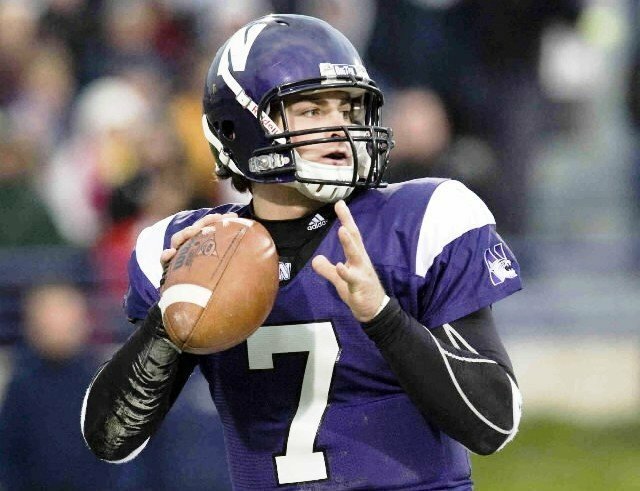 I’ll never forget the first time I became aware of Northwestern’s football team. It was in the fall of 1982, so I would have been a freshman in high school. The announcers during one of the game breaks said “They’re going crazy up in Evanston, because Northwestern’s got the lead late in the game.” It seemed odd that winning a game was a news story, but I didn’t know that they hadn’t yet won a game in the 1980s. That knowledge wouldn’t come until later. When it came time to choose a college, the importance of a school’s football program didn’t matter at all to me. I had already graduated from what seemed like Football high school, and that was enough. So many other things were more important. It’s a good thing I felt that way, too, because the Northwestern football team won exactly eight games in the four years I was there. 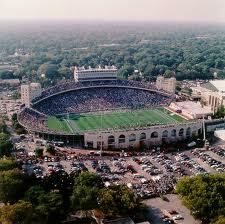 During my final year on campus–1989–the team went 0-11, and routinely heard laughter from the opposing teams’ fans. It was sad in every sense of the word. So sad that we amused ourselves during games by throwing marshmallows at each other, to take our minds off the carnage on the field. Those days are happily a thing of the past. The 1995 Rose Bowl season was the year that Gary Barnett broke through all of the losing ways, and for the following year, all of the important players were returning. It seemed like another good season lay ahead, so my wife and I purchased season tickets for the home football games. It was, and still remains, the only time I’ve ever had season tickets for anything. But for a college football team that’s only six games, which won’t break anyone’s budget. And it would allow us to buy bowl tickets too, so why not? The game that loomed largest on the schedule that year was Michigan. Michigan was the team that everyone measured themselves against back then. And Northwestern had beat them in the “Big House” the previous year, so there was some doubt that beating them twice in a row was possible. Through the first half, and into the third quarter, the game was very boring. Michigan had a 16-0 lead, and was driving for what looked to be another touchdown. The Michigan fans, who were decked out in their maize and blue gear, as always, began to chant “Go! Blue!” It didn’t look good for the Wildcats at all. And then the momentum swung in the blink of an eye. A Michigan receiver named Tai Streets, who was all-everything in high school and went on to an NFL career after college, had caught a pass, but coughed up the ball and Northwestern recovered. It felt like someone had lit a match among the Northwestern fans. From that moment, it felt like every play that Northwestern needed, they got. Third conversions, fourth down conversions, muffed punts by the other team, it was all going the Wildcats’ way. Pat Fitzgerald, the defensive player of the year in college football and now the head coach of the football program, was going out of his mind, getting the entire team fired up. The fans were on their feet the whole time, too, with the feeling that the game could not possibly be lost. The game came down, late in the fourth quarter, to a field goal to win the game. The Northwestern kicker made it, and pandemonium erupted in the stands. I had heard that term before, but it was the first time I had ever experienced it. If you’ve ever felt it before, you know what an indescribable rush it is. And if you haven’t felt it before, I hope you get the chance to feel it one day. It’s pretty special. But there was a problem. The ball had been snapped too early, and so the kick didn’t count. When the explanation for what happened came, and it became clear that another kick would be needed, the fans immediately went back on their feet. The past disappointments of years gone by didn’t matter. Michigan’s standing as the bully who routinely ate everyone else’s lunch in the Big Ten didn’t matter, either. The team had come just about all the way back, and it wasn’t going to come up short this time. When the kick went up again, and was good again, the ensuing second wave of pandemonium was even more intense than the first. 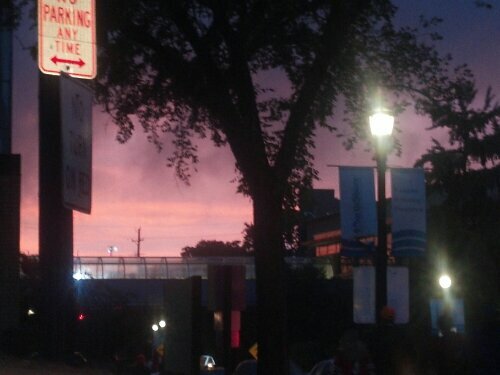 We stormed onto the field, relishing both the sunshine and the glow of an improbable, yet somehow inevitable, victory. Coach Barnett had told Northwestern fans to “Expect victory” that season, and that’s exactly what we got. I’m sure that it will never get any better than that, and if it does, I probably won’t be there to see it. There was another epic game in Evanston between Northwestern and Michigan some years later, with Northwestern winning the game, 54-51. 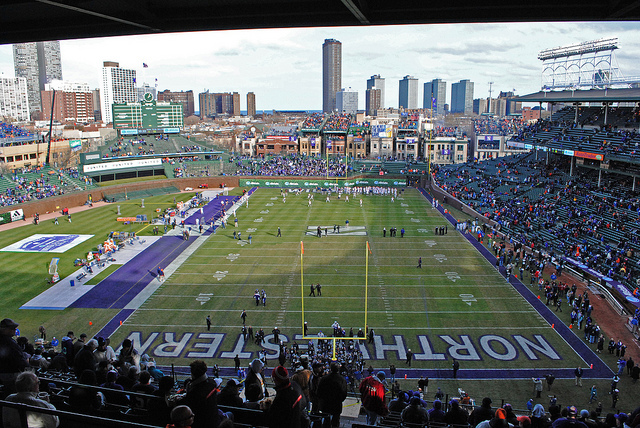 Although the players and coaches from these games have all moved on, there’s some hope that this weekend’s matchup in Evanston will be exciting, too. Michigan has returned to national prominence after the end of the Rich Rod era, but they haven’t yet played a game away from the Big House, until this Saturday comes around. Northwestern has lost two straight games, and doesn’t want another loss to go 0-2 in the Big Ten, right out of the gate. And Coach Fitzgerald can probably fire up his players as well as ever. So I’m hoping for a great game, even if I’ll be watching it from the comfort of my living room. Go Cats!